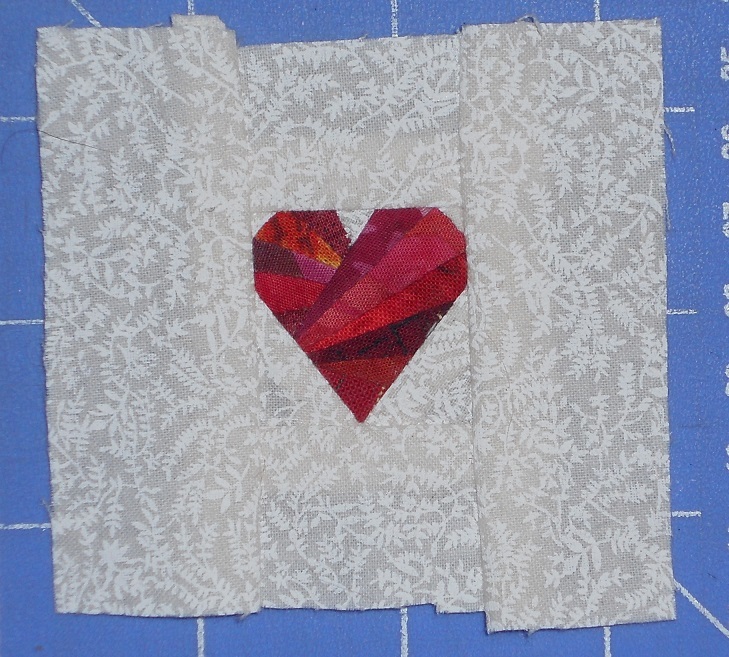 My friend Paula, who likes working in tiny pieces like me, made me this paper-pieced heart before she moved. The heart measures one inch square and has 12 pieces. So cool, right?! 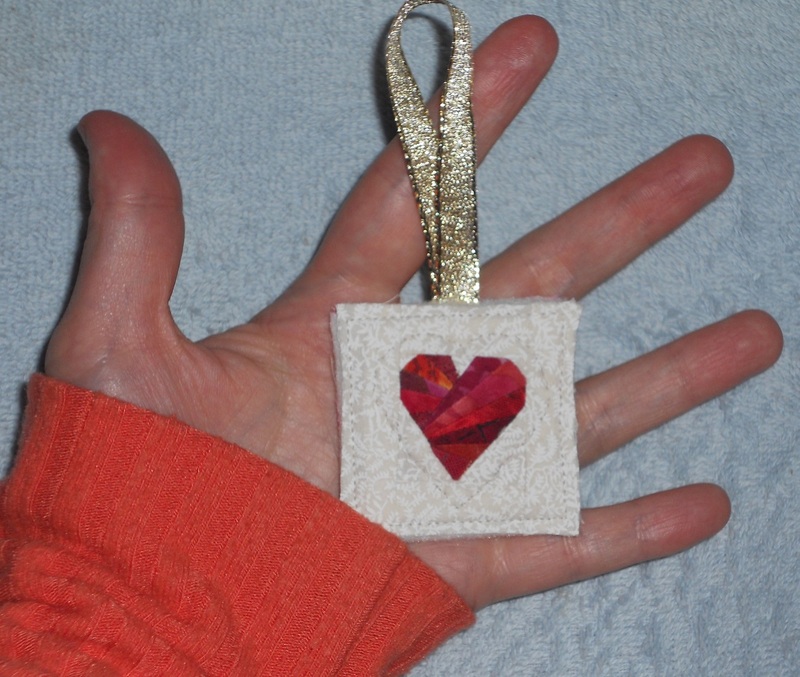 I made it into an ornament for this week’s Project Quilting Challenge which had the theme of finishing an incomplete project. So I made this cutie into a little ornament that will go on my idea board once my new studio (formerly a storage room/bedroom) is complete. That way I can look at it every day! Like the many fabrics in this heart, my friend has encouraged me to reveal all the parts of myself not just to her but in my art as well. We weathered joint events and separate ones and always found something to smile about. She made me feel important and seen… and let me see her as well. 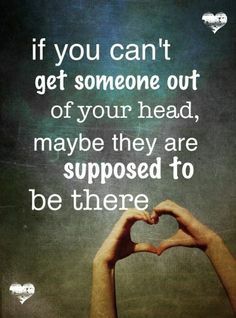 Do you have a friend like that? It’s such a special relationship that I’m not mourning her moving across country like I thought I might. Instead I’m delighting in hearing about her adventures in snowy Boston and looking forward to seeing her again. Nope, I don’t know when that’ll happen. But with a bond like this I’ll be making it a priority. I’m linking this post up to Show Off Saturday, Slow Sunday Stitching and Tuesday Archives. This entry was posted in Art, Artist's Studio, Challenges, Collaborations, UFOs and tagged appreciating friendship, being myself, finish the project, friend moving, heart ornament, making an ornament, move to Boston, paper piecing, Paula, project quilting, Show off Saturday, Slow Sunday Stitching, snow, tiny heart, tiny paper piecing, Tuesday Archives, UFO, UFO challenge on February 7, 2015 by quiltartbymegan. What a wonderful project… how sweet and tiny!